These light and sweet whipped shortbread cookies, with a cherry on top, are so quick and easy to make. Christmas cookie perfection! It’s almost Christmas time – which means it’s time to make some whipped shortbread cookies! I absolutely love Christmas baking. The only problem is that as the years pass, I am starting to have too many favourites! We have to pick and choose every year now. Especially since I do love to bake, and there’s all my childhood favourites, all my husband’s childhood favourites, and I have this need to try new things every year too. That makes for far too many cookies. So not everything gets made, or we’d have Christmas baking in the freezer all year long. These whipped shortbread cookies get made every single year though. Without fail. They’re my absolute favourite Christmas cookie – and I don’t even like candied cherries that much, so if they’re not your thing either, don’t let them stop you from making these! Oddly enough, even though this is my mom’s recipe, it’s virtually identical to the one my mother-in-law makes. So it’s on both mine and my husband’s list. Basically, they’re the perfect Christmas cookie. Whipped shortbread were the only cookie that my whole family would always make together every year when I was growing up. I think we’d usually make a double or triple batch because they were everyone’s favourite! We’d all have jobs. Dad would mix the dough and roll it into little balls, I’d press each one down with a fork, and my sister and brother would stick the cherries on top. I figured I had the best job because I never liked touching the sticky cherries. My son agrees with me on that and won’t help with that part. Evidently my mom got stuck with cleanup? I don’t remember. I do remember that making whipped shortbread equated to Christmas being just around the corner. If you’ve never tried whipped shortbread, add this one to your “new Christmas cookies to try” list. Maybe you’ll find a new family favourite too! I looked this up because I was curious! It’s called shortbread because of the large amount of butter in the cookies – the term short means crumbly, like pastry should be. So shortbread cookies are buttery cookies that are a bit crumbly. Don’t expect a chewy cookie – shortbread cookies are crisp, and a bit crumbly. What does shortbread taste like? There is a lot of butter in shortbread, but not as much sugar as you might expect, like sugar cookies. Shortbread has a buttery, lightly sweet taste – they aren’t overly sweet. If you like your cookies really sweet, you might prefer sugar cookies to shortbread. Yes, I freeze my whipped shortbread cookies all the time. Place the cooled cookies in an airtight container with wax paper in between the layers of cookies to prevent them sticking together and freeze for up to 3 months. They defrost very quickly at room temperature, and are very good even when they’re still cold. You can use a stand mixer, food processor or electric hand mixer to make these cookies – I’ve used all three with good results. Make sure you whip the dough well. It will be crumbly at first and then will come together into a ball – this takes 2-3 minutes of whipping in a stand mixer or food processor, and 4-5 minutes with an electric hand mixer. It takes longer then most cookie doughs do but the cookies will be difficult to roll into balls if you don’t whip the dough long enough. If candied cherries don’t appeal to you, you can make them without or put something else (chocolate, nuts, whatever you like) on top, but keep in mind that the cookies themselves aren’t super sweet. If you have a cookie press, these cookies can also be shaped with one of those instead of rolling the dough into balls and pressing it down with a fork. Here are a few more fantastic Christmas cookie recipes for you: Lacey Cookies, Almond Snowball Cookies, and Peppermint Pinwheels. Preheat the oven to 350 degrees F. Slice the candied cherries in half. In a large bowl, or the bowl of a stand mixer, cream the butter until smooth and fluffy. Add the corn starch, flour, powdered sugar, and vanilla, and whip until light and fluffy. Make sure to whip the dough until it comes together into a ball and isn't crumbly at all (see Notes). Roll the dough into small balls, about 1 tablespoon each, and place them about 2 inches apart on an ungreased cookie sheet. Dip a fork into a small bowl of flour and press the cookies down with it to flatten them. Make sure to dip the fork into the flour and shake off the excess before flattening each cookie so that it doesn’t stick. Place half a cherry in the middle of each cookie, pressing it down lightly. Allow to cool on the cookie sheet for 5 minutes before removing to a wire rack to cool completely. Store cookies in an airtight container at room temperature for 7 days, or freeze for up to 3 months. Be sure to measure the flour correctly for these cookies. 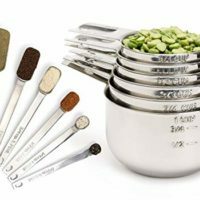 I use the dip and sweep method to measure my flour (fluff up the flour in the bin first, then scoop with your measuring cup and level it off with a knife or flat edge). I also measure my powdered sugar and cornstarch this way. I've included the weights as well, so you can use a kitchen scale instead if you have one. When whipping the dough, be sure to keep whipping until the dough has come together into a ball and is light and fluffy. It will be crumbly at first but will be smooth after whipping it for 2-3 minutes in a stand mixer or food processor, or 4-5 minutes with an electric mixer. If candied cherries aren't your thing, chunks of chocolate are good, or nothing at all - the cookies are great on their own too! Source: My mom has been making this recipe for as long as I can remember! These were quick easy and yummy!! I did have to add a few tablespoons of milk to get it to form a dough, otherwise it was just staying powdery. Just wondering if these would need any salt since the recipe calls for unsalted butter? I never add any. That being said, I have made them with salted butter instead and they are just as good. So you can definitely use salted butter instead if you like - I don't actually find it matters too much for these cookies. Hi Ann - I'm sorry, I've never had that happen. The only thing I can think of is that maybe your butter was too soft when you started so it warmed up a lot when whipping? It should be soft enough that it will indent when you press a spoon into the side, but the spoon shouldn't slide right through it. Hopefully that helps! I used a recipe from Best of Bridge that called for mixing ingredients for 10 minutes (said more mixing the better) so I used my food processor. The butter melted and mixture separated. Can I still use when butter hardens or should I throw out. I've never had that happen Amy, that's too bad! I would certainly still try using it once the butter hardens again - worth a try. I would put the dough into the fridge and let it firm up again (not cold and rock hard, just firm enough that it's solid and about room temp again) and then try mixing it to bring it together again (maybe with cookie paddles in a stand mixer instead if you have one? ), and bake them. I've never had that happen (and I've made these with my food processor many times - but I mix for 2-3 minutes in the food processor) so I'm not positive it will work, but it's worth a try. Good luck! Powdered sugar and icing sugar are the same thing. I tend to use either word - I'm in Canada and have always called it icing sugar, but always got a lot of questions asking what it was when I said that so have started saying powdered sugar more often now. I need to just start putting both words I think! Powered sugar is same as icing sugar. For some odd reason Americans tend to refer to it as powdered. I’ve made these for years, but mine are called “Pastel Melt-Aways”. You can tint the dough too, also roll two colors in a log and cut or roll in colored dots. I don’t use the candied jellies. Great recipe. Made this and it was super easy. Worked out great and was soooo light and tasty. Delicious! I measure the flour first, then sift it before mixing it in. Wonderful shortbread cookies! Thank you for sharing! Love the dipping in chocolate idea - I definitely need to do that next time! I'm not a big fan of the cherry myself and always make some plain, but the kids love the cherries. So glad you loved them! What is the correct length of baking time? The video says 10 minutes, written instructions say 12-14. Sorry Barbara - the written recipe is correct - typo in the video. I will have to re-edit that to make it right! Thanks for letting me know! 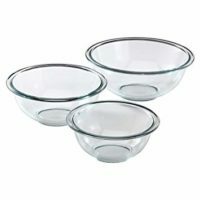 Do these work with margarine or vegan butter? I’d love to make them for potlucks so people with different dietary needs can still have a delicious treat! We have made them before with margarine (the hard brick kind, not the soft kind in the tub) and they work well, the flavour is just a bit different. I haven't ever tried them with vegan butter though. Can you make the dough and freeze to bake at at later time? I've never actually tried that as the dough mixes up very quickly. I have frozen the baked cookies (every year in fact) and they defrost very quickly when we want to have them. We will pull out a plateful and they will be defrosted within 10-15 minutes of taking them from the freezer so that's always been the way I've frozen them. I think if you wanted to freeze the dough to bake later it would probably work just fine after defrosting, but I haven't actually tried it so I can't say for sure! Made these today, don’t know if I did anything wrong. I found them very dry and not sweet at all. Shortbread isn't overly sweet, and it does have a dry, crisp texture. It's not supposed to be a moist, chewy cookie - they're meant to be lightly sweet, crisp, melt in your mouth cookies. So if that's what you ended up with then you likely did everything right! You might like these sugar cookies better if you're looking for a sweeter cookie that's chewy instead of crisp. Love this recipe! Super easy, simple to double or triple. And I love the delicate, crumbly crispness. Much better than store bought. My little girl said they weren't sweet enough, but I explained that was what shoetbread was. I can't wait to pair this with a coffee or tea. I made these yesterday & they are delicious & so easy. I have never had such a light & tender shortbread. They look like they take a long time, but are very quick. 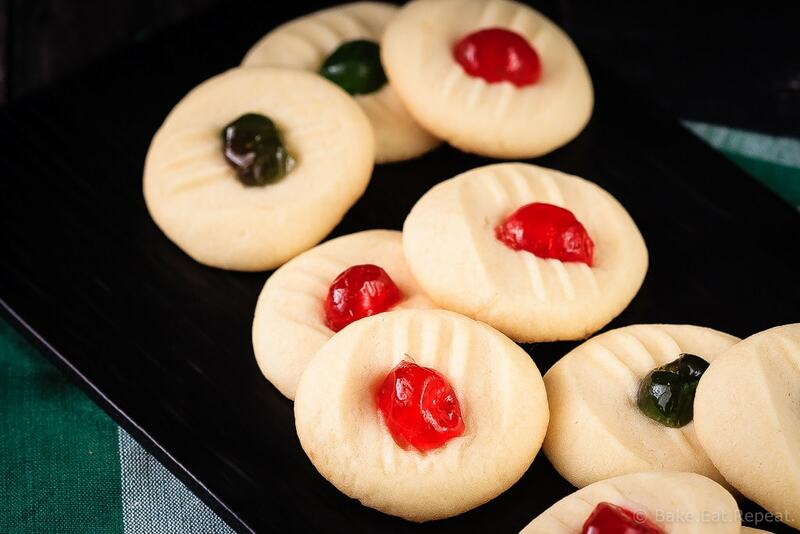 They are such a beautiful Christmas cookie with the cherries on top, but I think I will be making them year round because I can't stop eating them. Thank you for sharing your recipe. These turned out absolutely perfect! Thank you for the recipe! Made these today, they were so yummy! Thanks for sharing the recipe! Can these be rolled out and cut with a cookie cutter? Hi Sabiha - I'm glad you like the cookies! I don't actually display nutritional information on my recipes as that info can really vary based on the different brands of some products. If you would like to find out the nutritional info for any recipe on my site, you can easily copy and paste the ingredients into an online nutritional calculator to find out. Please send me the whipped shortbread recipe for bake eat and repeat? Hi Patsy - the recipe is at the end of this post, after the video and before the comment section. The recipe is at the bottom of this post, immediately after the video and before the comment section. Thanks Gail - the recipe is right on the post, below the video and above the comments. If you're on mobile, there is a button that you have to click that says "read more" right before the comments that will bring up the rest of the post. In the recipe card box there is a "print" button so you can print it out if you want. Let me know if you have any trouble! What a great video, Stacey! ... and this recipe is not only easy, but melt in your mouth delicious, just as you said they would be. These cookies look so tasty! We always did shortbread cookies growing up but I haven't had them in years. I think I'll add them to my baking list this year! Hi can you please give me the measurements in ounces. That would be great because I do not have cup measure. Thank you! I get 5 ounces of flour per cup when I weigh it. I haven't weighed the other ingredients for this recipe yet, but am planning to update it with all the weights this year when I make them! You could probably find the conversions online for most of the other ingredients though. The recipe is right below the video, and above the comments on the post. I just made these and they seemed to be perfect - Until I started baking them..the whole cookie sheet is one big cookie! it just melted together. I measured as descried and used standmixer..
Oh no! I'm not sure what could have happened, I've never had that happen with these. I use a shiny aluminum baking pan and don't grease it, not sure if you did anything different there that could affect things. I've also read that an oven that runs even 25 degrees hotter then it's supposed to can cause that. Other then that I'm not sure what it could be! Sorry they didn't work out for you! I'm so glad you liked them! Thank you so much for letting me know! Merry Christmas to you too! How long should you whip the butter before adding the other ingredients? How long do you whip the dough? Mine didn't turn out quite right and I measured like you said. I whip the butter for 1-2 minutes in a stand mixer before adding the other ingredients - basically until it's fluffy and there aren't any more lumps in it. Then I add the rest of the ingredients and whip again, for probably 2-3 minutes. It will be very crumbly at first and then come together into a dough at which point I mix for another 30 seconds or so until it's smooth. It will be a smooth, tacky cookie dough. What went wrong with yours? I had mixed reviews. I think it's more of a persons preference. My husband didn't like that they were kid of paste like in his mouth, for lack of a better words. My coworkers loved them. I'm sorry they didn't work out for you Roxanne. All I can think is maybe you measure flour differently then I do? I've been making these cookies for years and have never found them crumbly. 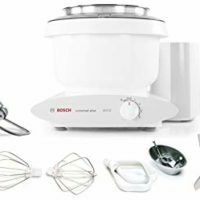 I use the dip and sweep method for measuring flour which will give about 5 ounces of flour per cup, and I sift after measuring, not before. I also whip the dough for several minutes before it comes together into a smooth dough, it is crumbly at first. Hopefully that helps! worst cookies ever, they taste like sand and fall apart like it!!!! Don't know what went wrong! Hi Michelle - I'm so sorry they didn't turn out for you - I'm not sure what went wrong. My family has been making this recipe as long as I can remember and they are always wonderful. I use the scoop and sweep method to measure the flour/corn starch in this recipe so maybe if you use a different method you ended up with a different amount of flour in your dough? That's all I can think that could cause the difference. So glad you liked the cookies Michelle! Merry Christmas! Hi Tammy, the instructions are right on the recipe card - below the video and right before the comments. Do you sift the powdered sugar/ flour before measuring it or after measuring it? I sift after measuring. I use the scoop and sweep method for measuring my flour (and powdered sugar), fluffing up the flour a bit before scooping it so that it's not packed down at all, and then sweeping the excess flour off the top of the measuring cup with a knife. I find I get the most accurate measurement this way. I then sift it into the bowl I'm using to make the cookies. 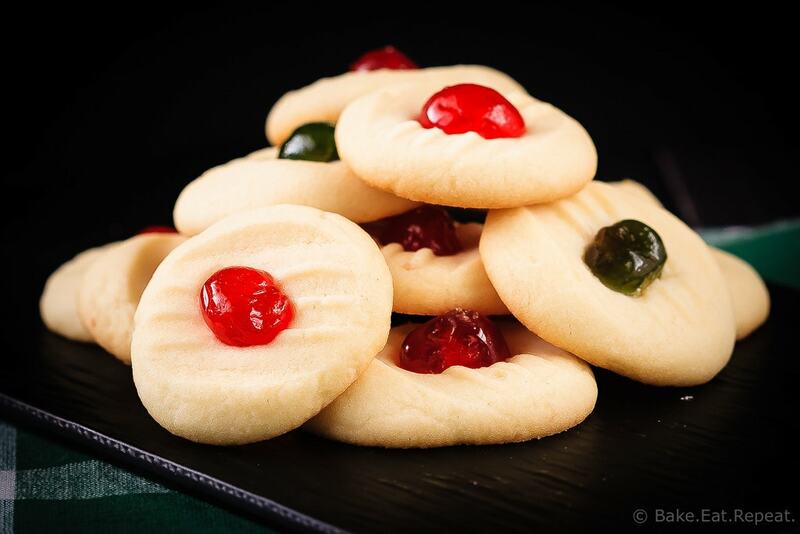 Great photos of the most delicious shortbread cookies EVER! When I asked Dad what his favourite Christmas cookie he wanted me to bake 'for sure' this year, it was, as you mentioned, our family favourite, Whipped Shortbread. It just wouldn't be Christmas without them! Yours look PERFECT! I hope mine look as yummy, so that my grand-kids enjoy mine as much as yours! (even if it IS the same recipe) One thing you've shown me that is different, though, is to roll the dough into balls and flatten them slightly with the fork. I've always done them as 'drop' cookies, and they end up in various sizes .... thanks, Stacey! I have never made whipped short breads but I think I'll try. Can these be put through a cookie press? I really like the whipped short bread. It's much lighter and more delicate than the regular shortbread. I know my husband and father-in-law don't even like regular shortbread, but they love these, so it is different. I have never used a cookie press for them myself, but my aunt always uses a cookie press for this recipe, and I think my sister has too, so you definitely can! Hope you enjoy them! wow! I'm so glad you are doing this. Whipped shortbread is my favorite too. I do almost no baking at my house ( because we would eat it and we don't need any more treats) but, it's not Christmas without it. 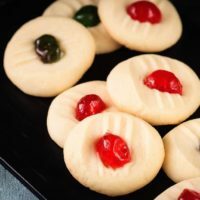 However, my mom always did them like a drop cookie rather than a ball but it still had that cherry thing on top. I can remember as a child, hiding those discussing things all over the house. Now I have fun experimenting with other thing to put on top. I've tried pecans, m&m's, smarties, And chocolate. Pretty much anything I have that's sweet. Keep blogging girl! Thanks Jessica! Glad you like it! I will admit, I'm not a huge fan of the cherries myself, but most people love them, and I will say that they look pretty! I may have to switch it up for chocolate one year though, that would be fantastic. These cookies are absolutely gorgeous! So perfect for the holidays. These are so pretty and easy to make too! I wanted to let you know that I am linking to this post if you don't mind. You're welcome to share your photos at my site if you'd like. Thanks Alyssa! I don't mind at all if you link to this post. Thanks for sharing! So sweet and cute looking cookies! Perfect treat for holidays! Pinning! these look wonderful! I love how easy they are and the Christmas themed colors ;-) super cute! These look delicious!! Love the cherries on top - makes them so fun and festive. Time does speed up once you have kids, Stacey! It's very disconcerting. These are gorgeous! I can see why they're your fave! These are my all time favorite cookies Stacey! And we also like to make them together with my family! Yours are zoo cute! Pinning and making them soon! I definitely cannot believe it's well into December ... I feel like I've gotten nothing done yet! But I guess I feel like that just about every year! :) Cookies like this are my favorite ... the ones that are family recipes we make over and over. These look wonderful!! so festive and so cute! Pinned! These look amazing and oh so pretty... like perfect shortbread! Wishing I had one to try right now! This looks amazing and I love the idea of whipped shortbread... wow! These look FABULOUS!! I've never seen shortbread with the fork marks. I love it! Christmas baking is my favorite! Can't believe how fast Christmas is creeping up on us this year too! I have so many things I still want to make - like these cookies! They look so pretty and festive! I've never heard of whipped shortbread! These look so fluffy and delicious. Happy baking! I know! It's hard not to make everything! I really wish there was a way to make like a quarter batch of everything, but the one egg in most recipes always messes me up! So hard to use half an egg! :) If you've never tried whipped shortbread, you need to, I love it. It's so much better than the regular shortbread which I find kind of dry and hard. Maybe I just haven't had a good one though! I can't believe that it's December 8th either! Christmas will be here before we know it! 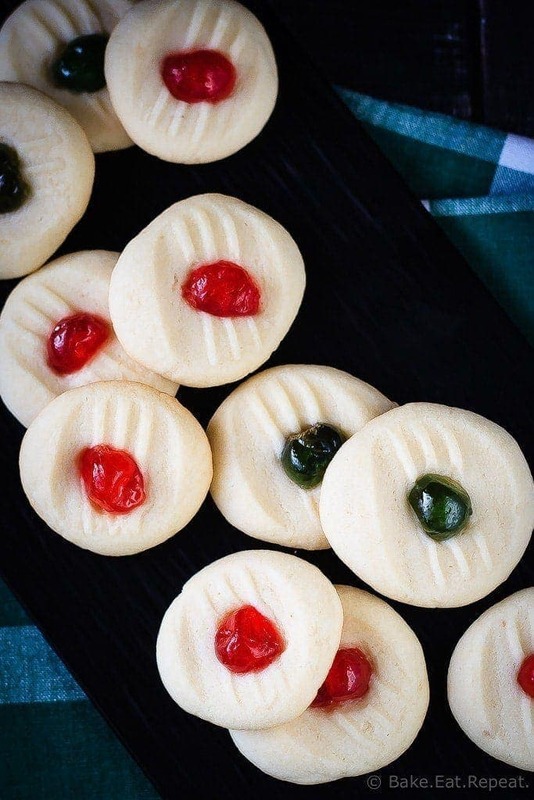 These shortbread cookies are so adorable, Stacey! I love the candied cherries in the middle. These are some of my favorite Christmas cookies, love them! I've made this recipe too from my Mom's collection. I also make it by replacing the sugar with 4 year old cheddar cheese and a 1/4 to 1/2 teaspoon of cayenne powder depending on your appetite for a bite! Try it - their great with a glass of wine or a cocktail. I have never tried a savoury version of shortbread but it sounds like a fantastic idea! I'll have to try that this year - thanks Bob!